When you have complete information on production bottlenecks and unrealized potential, it is easy to improve productivity. However, information gathered with traditional methods is not reliable. It is not available in real time, nor is it systematic. Fadector is an automatic system that collects status data from production machinery reliably and systematically. It helps you increase the number of production hours without investing in additional machinery. It is time to get rid of traditional data collection methods, such as pen and paper. Inspector collects production data reliably and without human errors. The information is always available, and always in real time. The modern software program has been designed to be easy to use. It is visually pleasant and the needed information is easy to find. A data collection system has to produce flawless measurement data in order to be useful. Inspector is well-protected against temporary network errors. Inspector can be connected to almost any production device. Machine tools and robots can both be integrated with the measurement system. Inspector can also be integrated with other production devices such as furnaces or cooling pools. 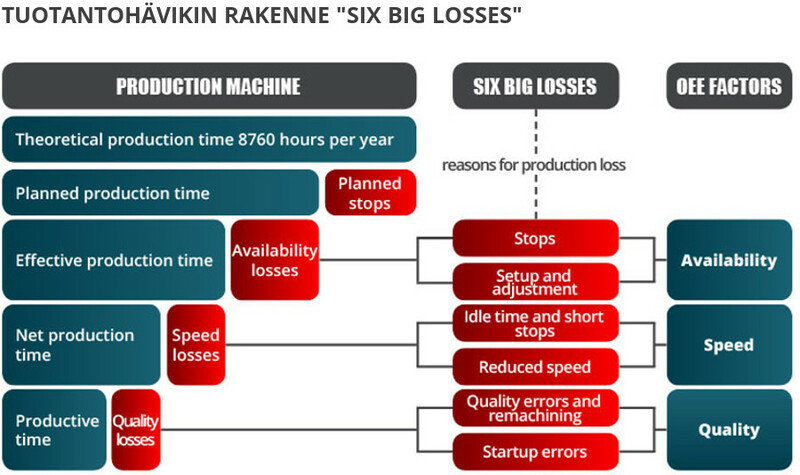 The overall equipment effectiveness (OEE) of production machinery is an advanced measurement method, with which you can determine how effectively the production machinery or production line is able to carry out its tasks. OEE calculation is based on three factors: availability, speed, and quality. OEE is a tool that helps focus the improvements in the right places and ensure that they are as effective as possible. The key to improvement is to remove factors that limit production. It is important to have reliable data on your production. Operators, supervisors, development personnel, and managers need valid, up-to-date information. Measuring your OEE affects the operators and your company, but also your customer relationships: your delivery reliability improves, capacity increases, costs decrease and become more manageable, and the the effectiveness of labor increases. Who can affect the OEE? OEE is a production key figure, and at best your entire personnel can be committed to measure and improve it. The operators naturally play a key role, but service personnel are also very important in ensuring the availability of production machinery, and management and process planners can tackle structural problems in your production. OEE is a common indicator that shows you the right way to continuous improvement and minimizes part optimization. Inspector ADC provides the user with a simple and clear view of the production machinery. You can monitor the availability and utilization rate figures of your production machinery, and their development over time, at a glance. Availability is the time when the machine is available for production. This means that the machine is ready to work and there are no errors or faults. Utilization rate is the ratio of actual production time compared to the available time. Optimizing the utilization rate is one of the key issues when improving your production. A higher utilization rate increases the productivity of the production machinery, reduces the investment payback period, and increases your profits. When you want to know exactly what is going on, Overall equipment effectivess, OEE, is an excellent figure to monitor. OEE describes the real effectiveness of the production machinery by taking into account availability, speed, and quality. OEE is a key figure in measuring the goals of continuous improvement (LEAN). Inspector OEE expands the functionality of Inspector ADC to include speed and quality figures needed to calculate the OEE. Condition monitoring requires regular condition measurements. Inspector CM collects measurement data, either wirelessly or using traditional methods and reports the findings in a HTML5 -format. With the latest technologies, monitoring for example in machinery and process industries can be done cost-effectively and reliably to critical items such as bearings, gearboxes, valves and steel structures. Plentiful amount of parking space in front of our office building.